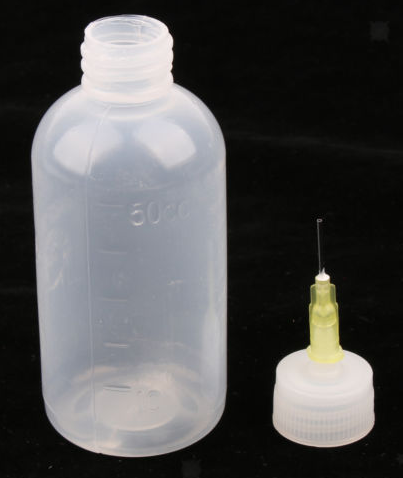 #0013, 50mL Milky White Glue Applicator Bottle: Now you can put a pin-point of glue EXACTLY where you want it. The large bottles of glue you normally find at your local variety or hardware store are too big for gluing small parts. This small 50mL bottle is perfect for those small jobs when building your Campbell kit. This bottle is milky-clear and comes with its own applicator needle tip. Bottle dimensions: about 3 inches tall and 1-3/8 inch in diameter. Note: the bottle printing says 50cc, which is also 50mL. Click here for extra Glue Bottle Tips. Dimensions: about 3 inches tall and 1-3/8 inch in diameter.